Jorge Lorenzo won only his second MotoGP race in Japan yesterday with a brilliant ride to defeat Fiat Yamaha team-mate Valentino Rossi in a captivating Twin Ring Motegi race. The Spaniard, who hadn’t won since the third race of 2008 in Estoril, fended off the determined challenge of reigning world champion Rossi to win the 700th premier class race in history. Fourth at the end of the first lap. Lorenzo quickly latched onto the back wheel of Rossi’s factory YZR-M1 after the Italian had failed to make an early breakaway from the pursuing pack. Lorenzo needed two attempts to claim the lead on the ninth lap, his second clinical move under braking at the end of the back straight proving decisive. Rossi, who was also second in the season’s opening race in Qatar, exerted intense pressure on Lorenzo until lap 15 when an electronics glitch blunted his charge, and that pitched him back into an exciting scrap for third with a resurgent Dani Pedrosa. The Repsol Honda rider, who had made a stunning start to burst through to third at the first corner from the fourth row of the grid, passed Rossi twice on lap 17, but any hopes he might chase down compatriot Lorenzo were quickly dashed as 30-year-old Rossi hit back on lap 19. Rossi himself then mounted an impressive but futile late attack to pressurise Lorenzo into a mistake, but the double world 250 champion remained ice cool to win in front of a huge gathering of senior Yamaha management. 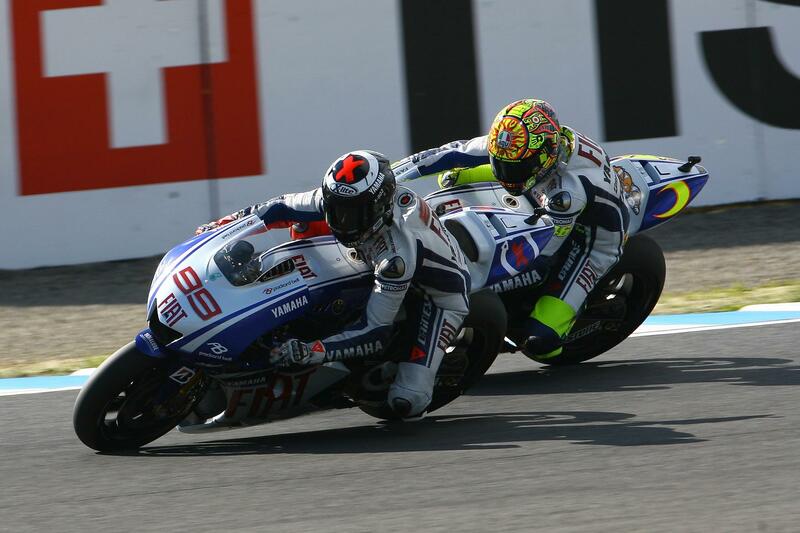 Rossi was gracious in defeat, simply admitting that he didn’t have the speed to cope with Lorenzo. He was just happy that the race had been a much more exciting affair after the dour and processional opening race in Qatar. Pedrosa described his podium as ‘unbelievable’ but his race was determined by his incredible start as he had a close battle with team-mate Andrea Dovizioso for long periods.